Eurus Energy America Corporation is pleased to announce that it has executed a construction and term financing agreement in a club deal arrangement with Joint Bookrunners/Mandated Lead Arrangers Bayerische Hypo-Und Vereinsbank AG and Dexia Credit Local on its 63MW Combine Hills II wind project located in the State of Oregon. The wind farm is located on approximately 13,000 acres of farmland near Milton-Freewater, in Umatilla County, near Eurus’ existing Combine Hills I project and will consist of 63 Mitsubishi MWT-62/1.0 turbines, each rated at 1MW. 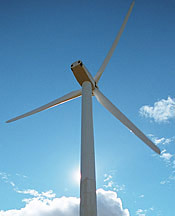 It is the second project completed by Eurus in Oregon and is its ninth wind project in the United States. Eurus expects to begin construction in July and electricity from the project will be sold to Public Utility District Number 1 of Clark County under a power purchase agreement signed in March 2009. “Eurus Energy is pleased to have secured the necessary financing in this credit-constrained environment with Unicredit (HVB) and Dexia. We are also thankful for the support from the local community and county, Clark County Public Utility District and the Bonneville Power Administration in making this project possible. With the completion of Combine Hills Phase II, Eurus’ projects in Oregon will be generating enough renewable energy to meet the electricity needs more than 26,000 households in the Pacific Northwest,” stated Mark Anderson, President and CEO of Eurus Energy America Corporation.